We have just opened the recruitment process for a Senior Analyst, who will provide the technical leadership for the ACAPS Yemen Analysis Hub; and a Data Analyst to support the collection, analysis, publication and dissemination of data. The ACAPS Yemen Analysis Hub was set up to conduct integrated analysis in support of humanitarian and development actors working on the Yemen crisis. Being a non-operational organisation, we strive to support the understanding of humanitarian needs and developments in Yemen by analyzing the available data in an unbiased and inter-sectoral manner. Find out more about the Yemen Analysis Hub Senior Analyst position and how to apply. 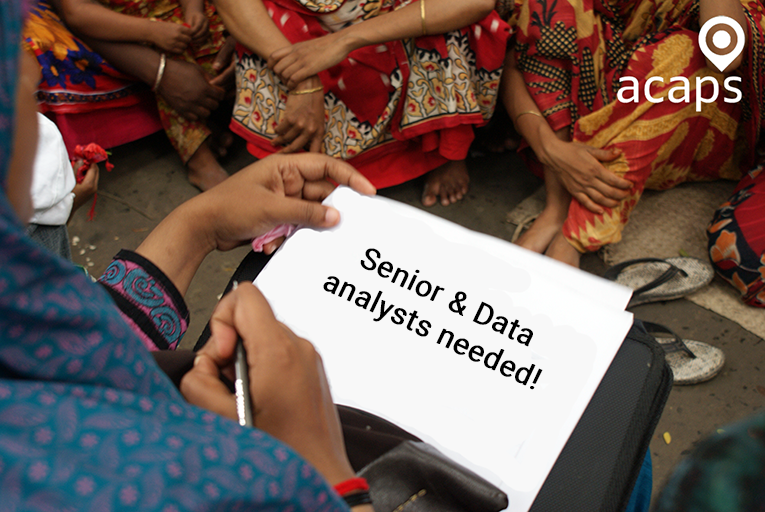 Find out more about the Yemen Analysis Hub Data Analyst position and how to apply. These positions are based in Amman.